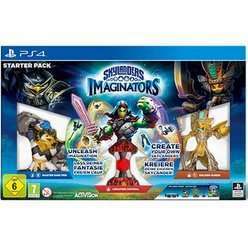 Skylanders Imaginators starter pack for PS4. Cheapest it's been and is now around £50 at argos, smyths, Amazon etc. I paid £31.99 Wednesday Xbox one and they threw on Kaos figure too in the box. I have no idea if that was part of the deal but there in the box he was. I paid £31.99 Wednesday Xbox one and they threw on Kaos figure too in the … I paid £31.99 Wednesday Xbox one and they threw on Kaos figure too in the box. I have no idea if that was part of the deal but there in the box he was. Any retailers selling Imaginators Solus game? game really messed my order up, ordered Imaginators for Xbox one for £31.99 on 28 November, took them till 5 Dec to tell me they cancelled my order , now it's 54.99 , spoke to two people and they won't honour the original price.